An ally of potential national security adviser Robert Harward is soliciting resumes from a who's who of Republican foreign policy insiders and says the retired admiral and former Navy SEAL plans to revamp the White House’s National Security Council following the resignation earlier this week of Michael Flynn, according to an email obtained by the Washington Free Beacon. Mary Beth Long, a former CIA officer and official in the George W. Bush administration, recently emailed a handful of prominent foreign policy leaders in Washington, D.C., to gauge interest in serving under Harward. Long, who signed a letter critical of Donald Trump during the 2016 campaign but later changed her opinion of the New York real estate developer, said in the email that "Bob Harward is going to ‘start over' at the NSC in about two weeks." Republicans and Democrats alike have championed the selection of Harward, who served on the National Security Council during the George W. Bush administration and is close to Defense Secretary James Mattis. This includes several former Obama administration officials such as Tommy Vietor, who served as the NSC’s spokesman under Obama. But Long's email, as well as the positive reception of Harward among former Obama officials, has spooked several current officials who worked under Flynn. They are concerned that Harward is planning to wholly revamp the NSC and remove staffers close to Flynn’s former team. Harward "plans a housecleaning of Trump's National Security Council staff," read the headline on an article Wednesday in Foreign Policy. These fears come at a time when multiple reports indicate that there is disarray among team Trump and fractures among its senior staff. A restructuring of the NSC at this time could harm the Trump administration and contribute to further disarray inside the White House, according to sources familiar with NSC deliberations who spoke to the Free Beacon late Wednesday about the matter. Long informed her colleagues included on the email, many of whom also opposed Trump during the campaign, that she could help secure them a spot under Harward. 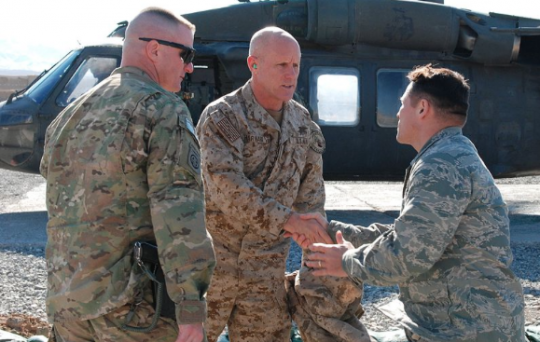 It is unclear if Harward is aware of the effort. Long said the email was meant to help the Trump administration tap the best minds for a job in the White House. "I feel an obligation to do what I can to help them do what they do best ‘serve their country and the President' if permitted," she told the Free Beacon, adding the email was sent to "true professionals in the field" who would benefit the Trump administration. "Please let me know (and please don't think this is an endorsement—I leave that to you, just didn't want the opportunity to pass if it is given)," Long wrote in her email to the group of Trump critics. "You all have worked so very hard." Inside the White House, current staffers are worried that a reshuffling so early on will hamstring an administration that is already struggling to maintain control of the public narrative. The NSC in particular could find itself behind the curve if Harward brings in his own team of confidantes. Those already working on and with the NSC have spent months planning their course of action and have worked to identify elements of the administration still staffed by those who oppose Trump. Multiple reports have indicated that the leaks targeting Flynn were in part spread by Obama administration loyalists still working within the government. Those inside the White House fear that a massive overhaul would turn back the clock and erase some of the work already taking place inside the White House, according to those sources familiar with current NSC deliberations. "I never informed my colleagues that I could ‘help secure' them jobs," Long wrote in an email to the Free Beacon after this article was published. "In fact, I specifically state that this is not an endorsement and that I would provide the resumes if ‘given the opportunity.' These are dedicated and talented professionals whose work is exceptional and who welcome the opportunity to serve their country. The article inaccurately characterized the recipients of the email as ‘Never Trumpers' and both the purpose and intent of the email." This entry was posted in National Security and tagged National Security Adviser, Robert Harward. Bookmark the permalink.